Commentary, What's Race Got To Do With It? In Commentary, What's Race Got To Do With It? In case you missed it earlier this week, analyst Will Munn has authored an important new entry in the NC Budget and Tax Center’s “Prosperity Watch” series. 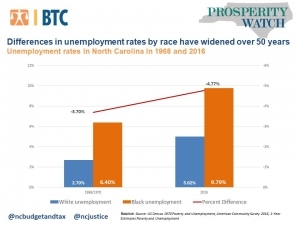 His finding: Despit some progress the data confirm that African Americans in North Carolina still must confront large economic barriers. Fifty years ago, the Kerner Commission concluded that “pervasive discrimination in employment, education and housing” and structural racism had created barriers to opportunity for African-Americans to earn, save and engage in civic life. Reflecting on the Kerner Commission report after five decades, researchers from the Economic Policy Institute last week revealed that progress has been made in absolute terms for African-Americans but limited in removing barriers that maintain persistently high differences in outcomes for African Americans relative to whites. Nationally, researchers from the Economic Policy Institute found that 34.7 percent of all African Americans nationally lived in poverty in 1968, compared to 21.4 percent today. Correspondingly, 10 percent of whites in 1968 lived in poverty compared to 8.8 percent in 2016. In North Carolina the census of 1970 found that 38.7 percent of African American families lived in poverty compared to 11.1 percent of white families in North Carolina. In 2016, a similar measure found that 23.4 percent of African Americans in North Carolina lived in poverty while 12 percent of whites experienced the same economic status. Both nationally and statewide these numbers represent progress for African Americans with a decline in absolute poverty rates and a reduction in the difference in the experience of poverty for African-Americans and whites. While that difference was 27.5 percentage points in 1968, the difference dropped to 11.45 percentage points in 2016. Nationally and at the state level, differences in the unemployment rates by race have widened over the past 50 years. An unemployment rate gap in North Carolina that was nearly 4 percentage points 50 years ago has now stretched to 5 percentage points. 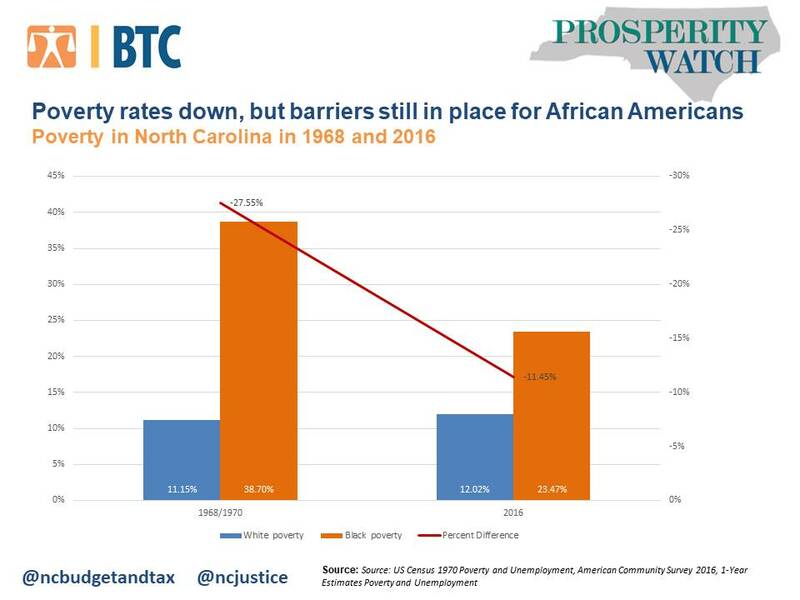 While important to acknowledge the drop in poverty both in absolute and relative terms for African-Americans, the persistent barriers in employment will continue to leader to differences in economic outcomes that keep North Carolina from reaching our full economic potential. Jones, J., Schmitt, J., & Wilson, V. (2018, February 26). 50 years after the Kerner Commission: African Americans are better off in many ways but are still disadvantaged by racial inequality. Retrieved from https://www.epi.org/publication/50-years-after-the-kerner-commission. Bohme, F. G. (1976). 1970 census of population and housing: procedural history (United States., Bureau of the Census). Washington, DC: U.S. Dept. of Commerce, Bureau of the Census.